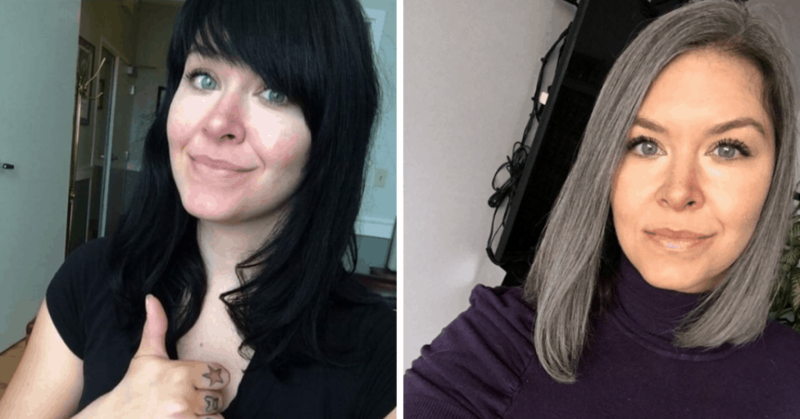 Before I ditched the dye last February, I fretted at the way I looked in photos. 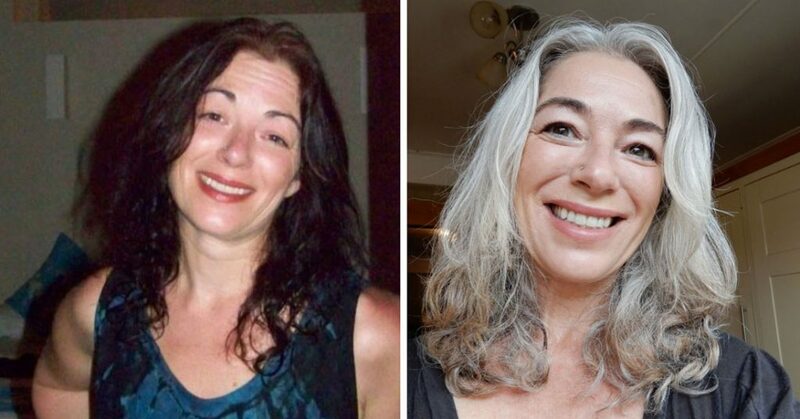 I blamed it on the aging process, but I now think it was the dyed hair that sapped all the color out of my face. Why do I think this? 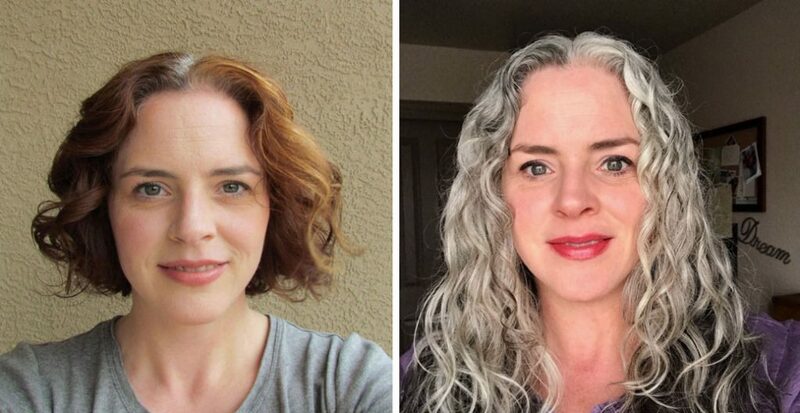 Because once I stopped dyeing and embraced my grays, my complexion brightened up considerably! 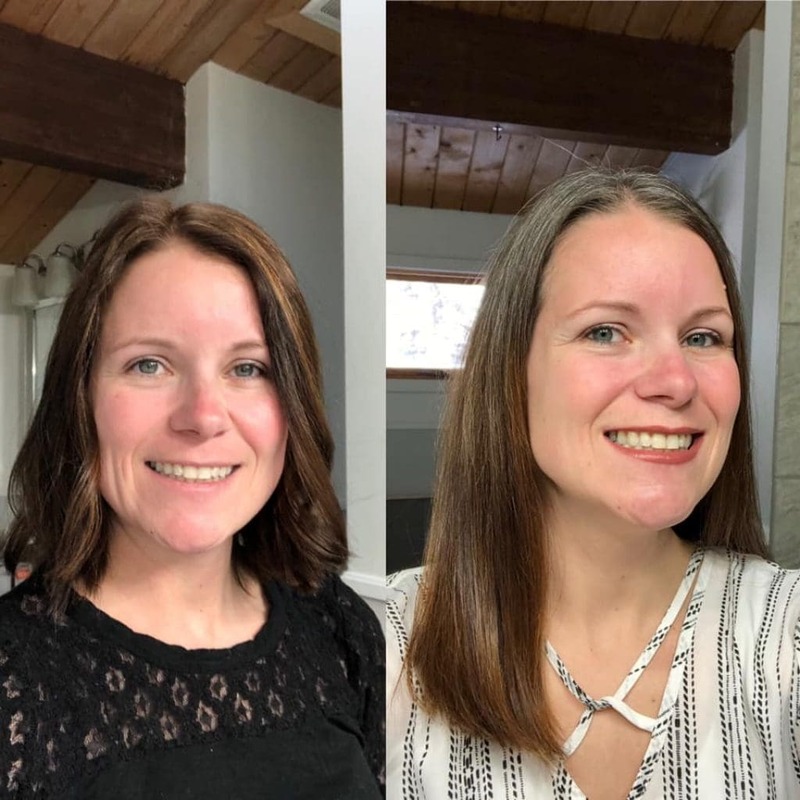 I am surprised to find that I look younger in photos now than I while I was dyeing my hair. Other silver sisters I’ve spoken to feel the same. It’s a common refrain in the gray hair Facebook support groups: Mother Nature knows what she is doing! 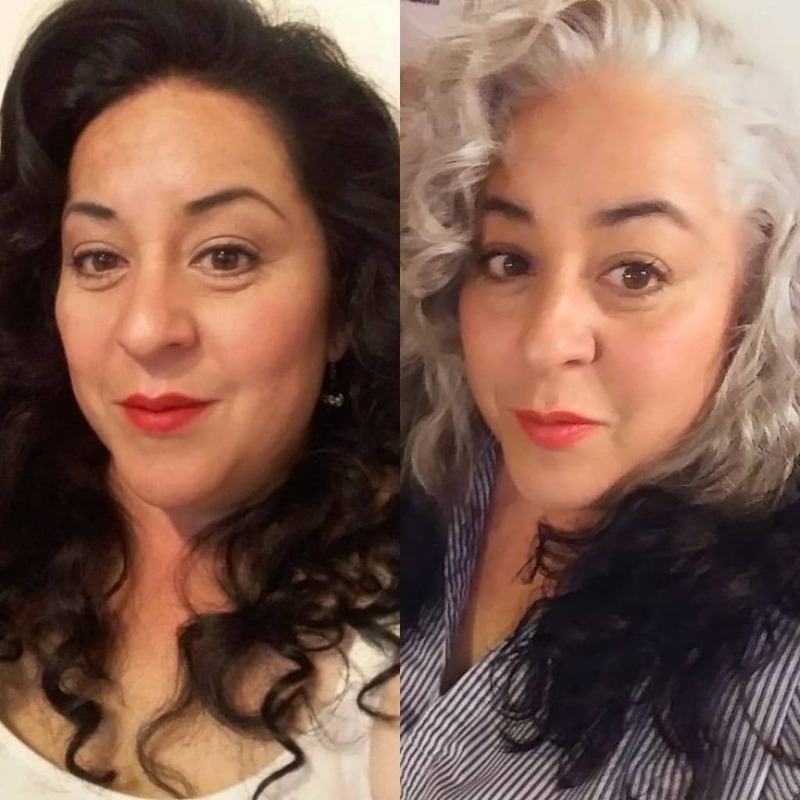 I asked my silver sisters if they’d be kind enough to contribute their before & after gray hair photos to this post so we could check this phenomenon out. 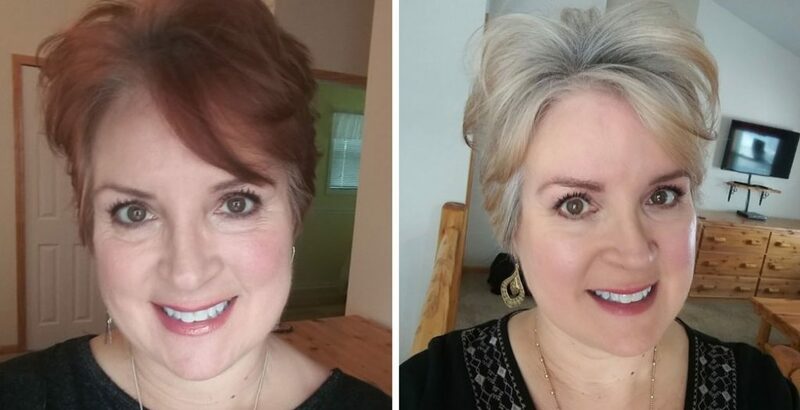 I think you’ll see what I see: the gray creates a softening/brightening effect to the complexion, which is really flattering, especially compared to the harsher effect created by dyed hair. All of the Instagram and other photos on this site are used with permission. 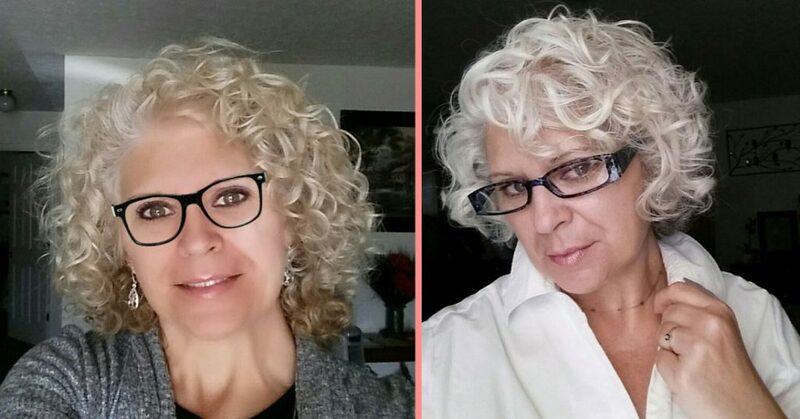 Check out Joli’s Transition story here and read about her amazing gray hair products here! 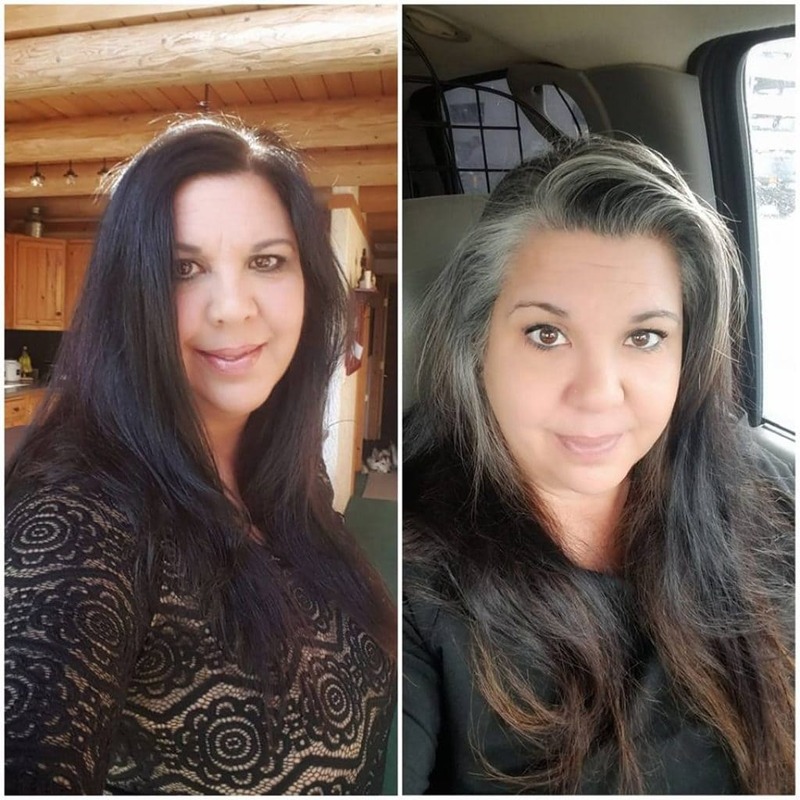 The next group of Before/After Gray Hair pictures were shared with me on Silver Revolution, the awesome Facebook gray hair support group. Why?! 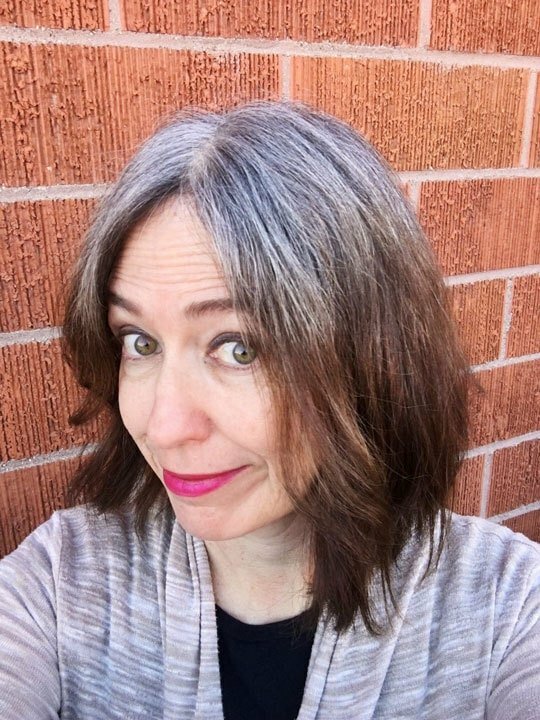 Because it is nearly impossible to go gray without getting some (or a lot!) of negative feedback, so it REALLY helps to have a great group of online friends giving you the support that you might not be receiving at home or in society. 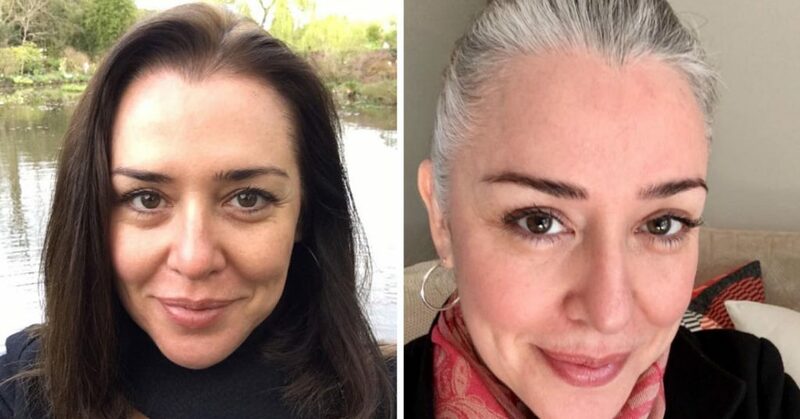 Rhiannon, 38 – Check out her Transition Story here. 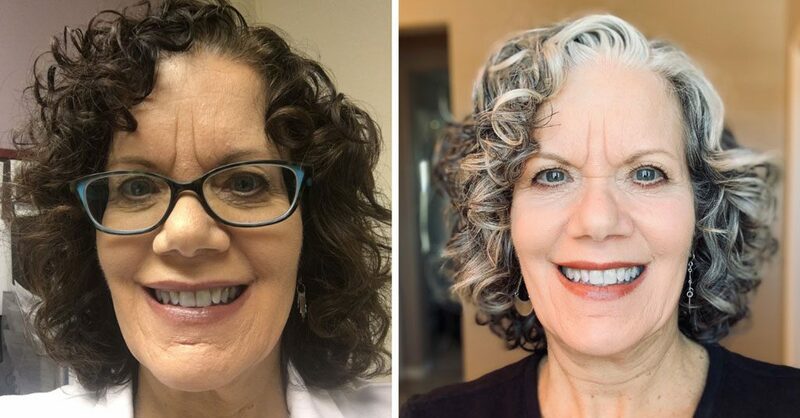 Look again at the photos: Even the ladies who are not fully gray have a vibrancy to their complexion. To me (at least), their faces seem brighter. 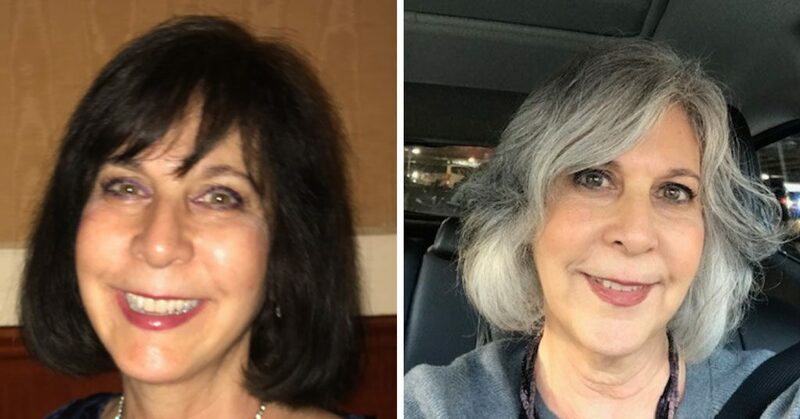 I hope that the current climate of gray hair acceptance can make a lasting impact on our culture so that these ideas get flushed down the toilet where they belong. I thought it was hilarious, but it’s also kind of true. 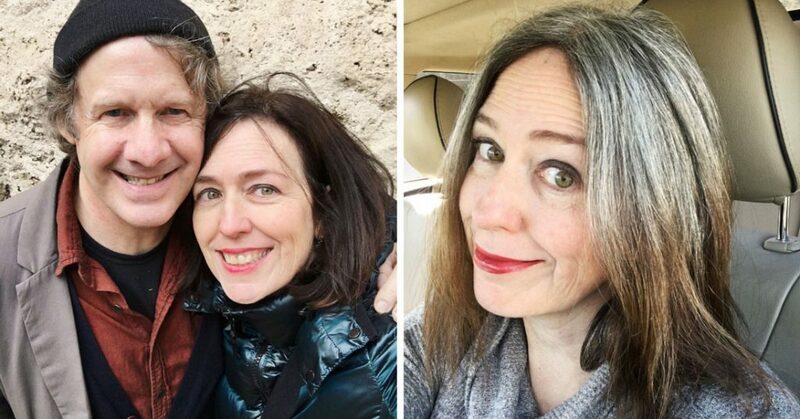 Listen, if nobody dyed their hair, we would see people from a wide range of ages sporting gray hair. 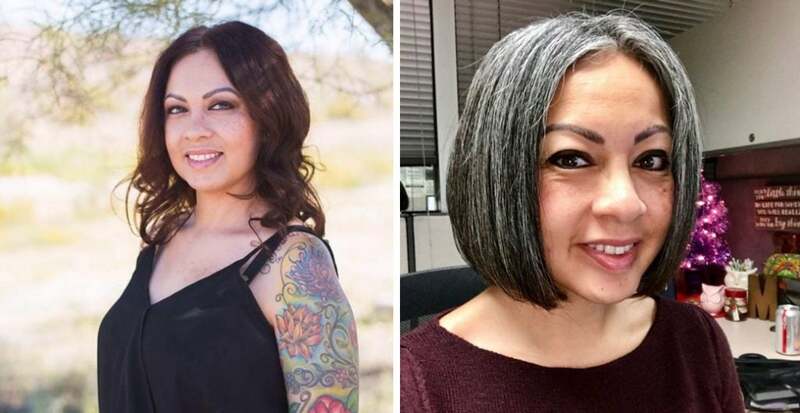 Some people go gray young; some people live to 100 with hardly any gray hair. I hope that we can get people to see silver as just another color. I think that’s the first hurdle. 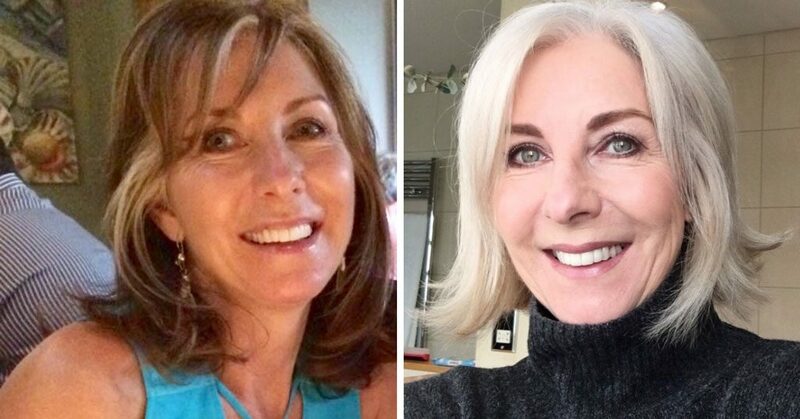 After that, maybe the sexist and ageist walls will start to crumble… Do you think? 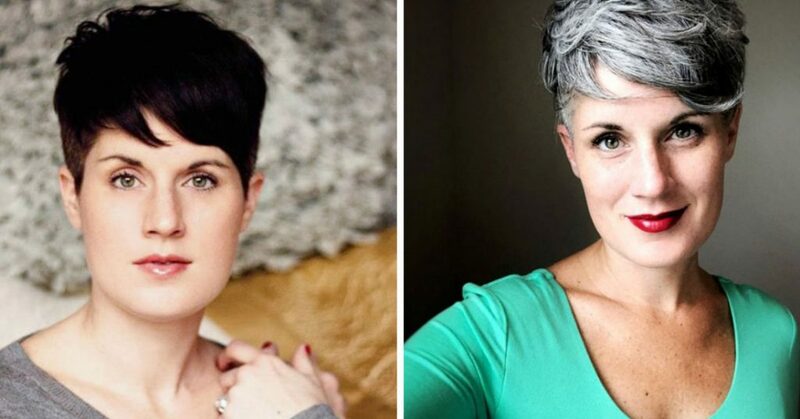 Let me know your thoughts in the comments, and what you thought of these great photos of women (of all ages) with gray hair! 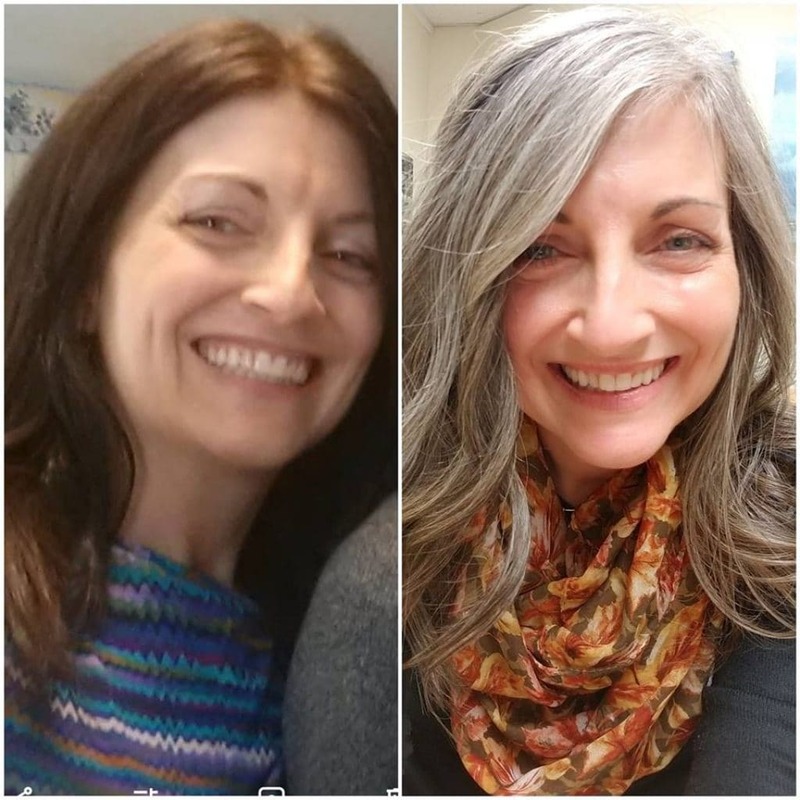 What Colors Work Best with Gray Hair? 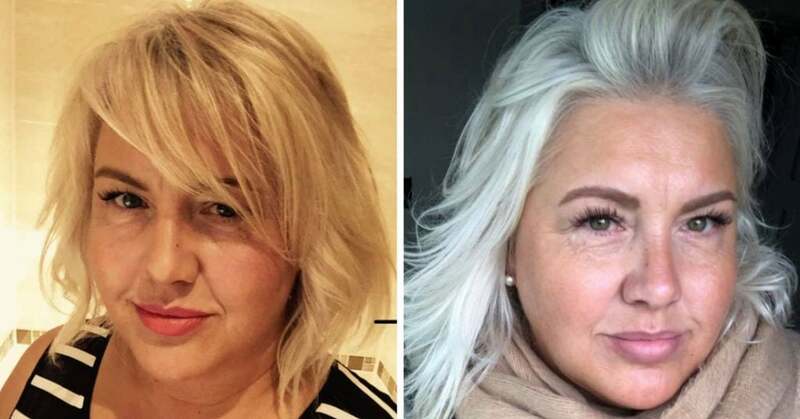 Gray or white hair is the fashion trend right now. 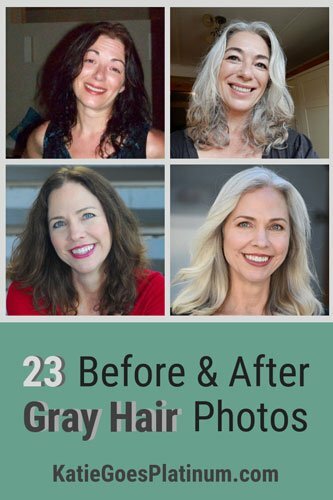 I’ve been gray for a few years now. I got tired of coloring the roots. 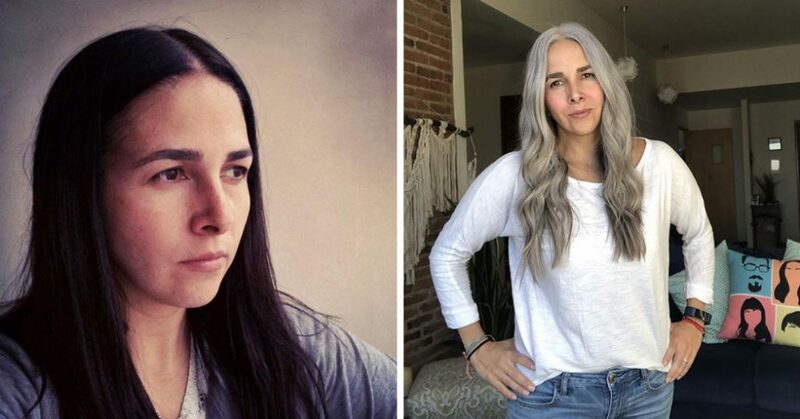 I’m so jealous of all the women that have beautiful natural solid white hair. 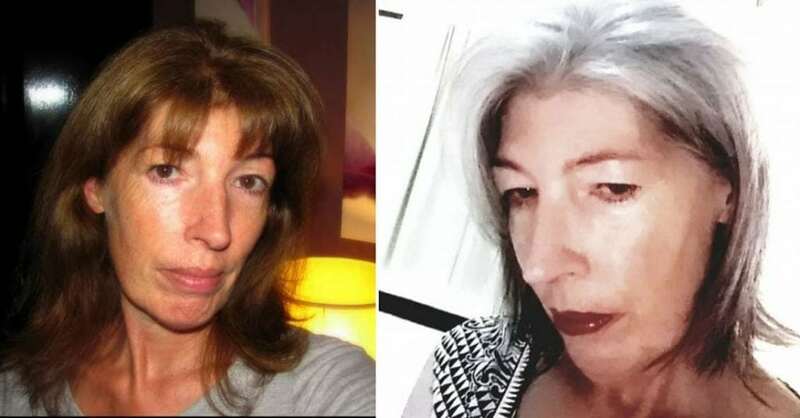 I had my hairdresser bleach mine hoping for the solid white look but it didn’t turn out like I’d hoped. 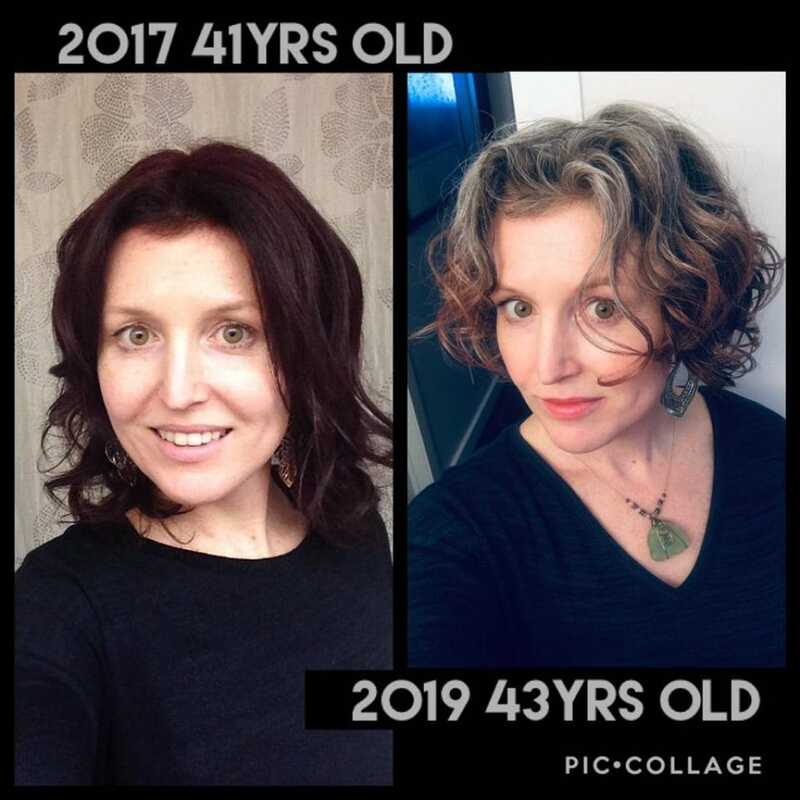 So it will be growing out again to my natural color. 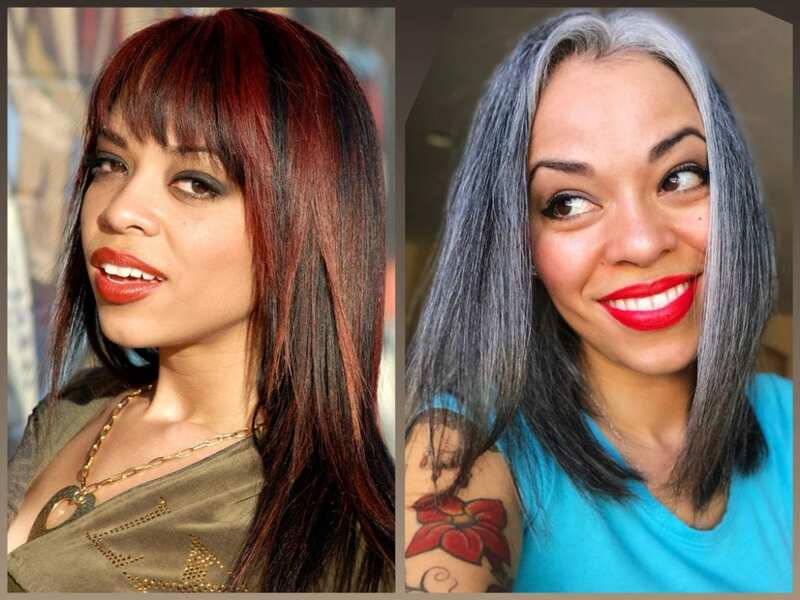 And I think long gray hair is gorgeous if taken care of and styled. Beautiful pics Katie. 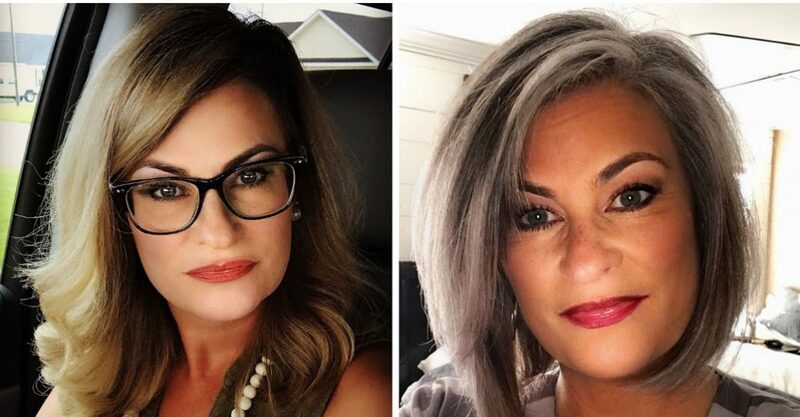 I’ve been thinking about going gray for a long time now and these pics just settled it. I’m tired of covering the gray too. It’s now time to let it shine just like my silver sisters!! Wow! Everyone looks so beautiful! I’m not afraid to go natural (which will be sooner than later) thank you. And my husband should be proud of his silver too! 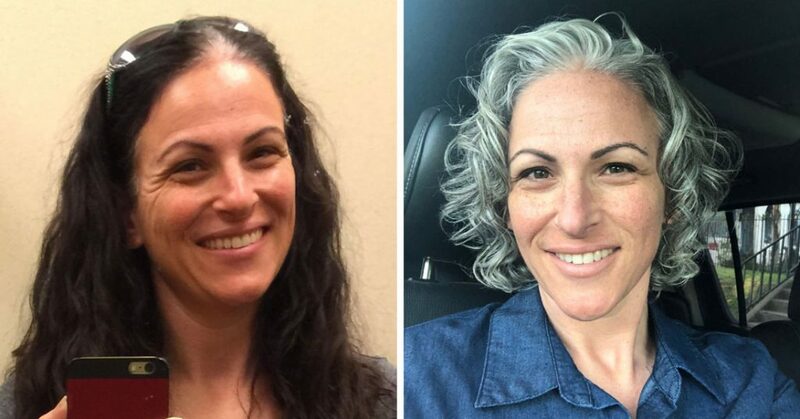 I’m so much more confident now that I’ve grown out my gray. Before I was consumed with coloring my roots, and when would I have time, scheduling my weekends around it. That’s just crazy, I get so many compliments on my hair!! If you are thinking about it, DO IT!! 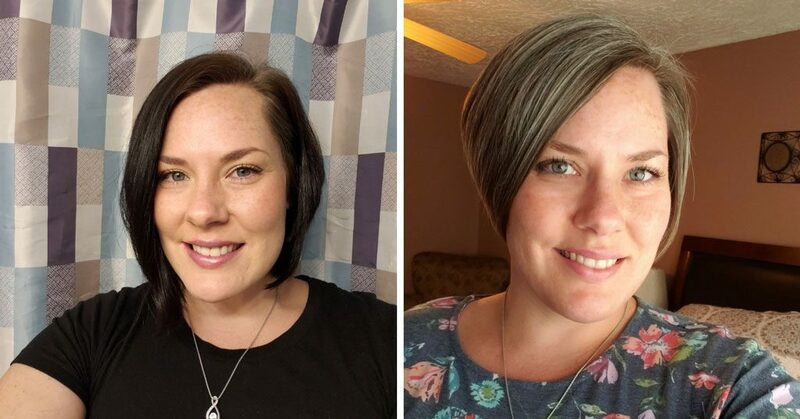 Been 5 or 6 months since color and I decided to see what my natural color is. I am 59 so by next year ill have my answer. These posts are motivating!! I’m so glad they help, Beth! 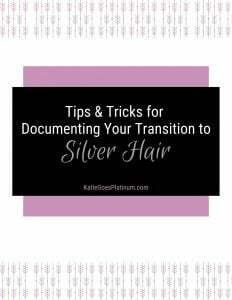 Good luck with your transition! Interesting. To me, the age issue is neither here nor there. 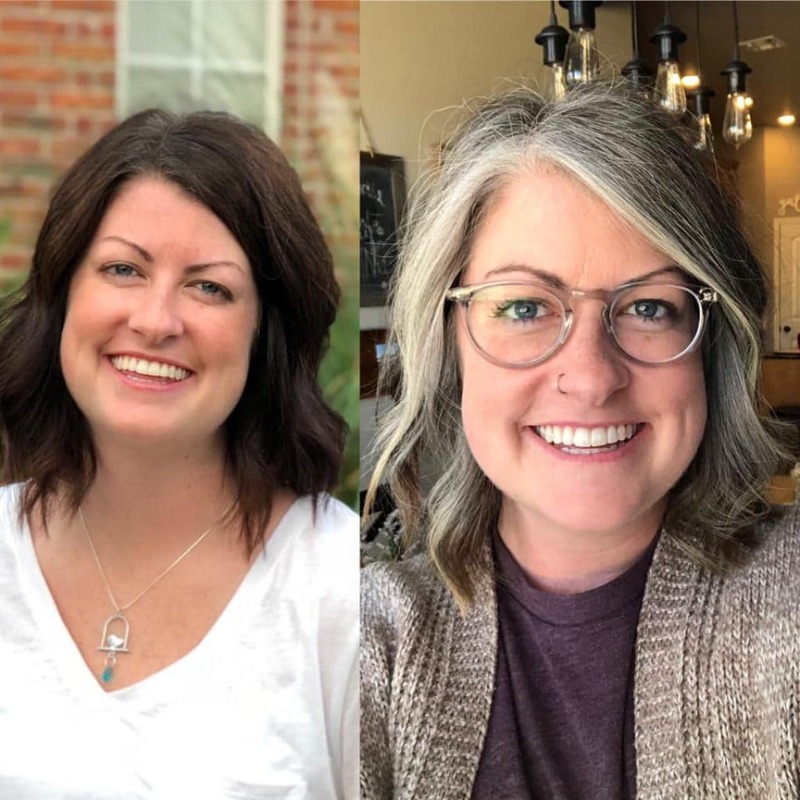 Rather, my perception is that all of them were rather bland and non-descript other (than safe and banal) in their before photos. 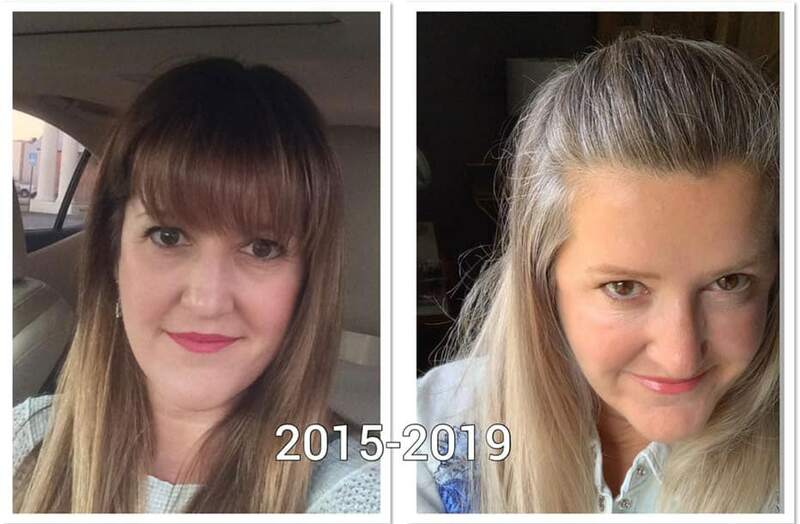 It’s in their after photos that they come to life! They all shine literally and figuratively. 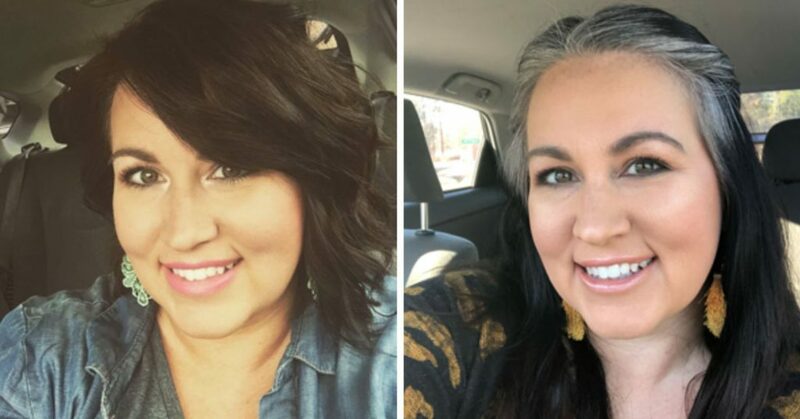 What an amazing process! 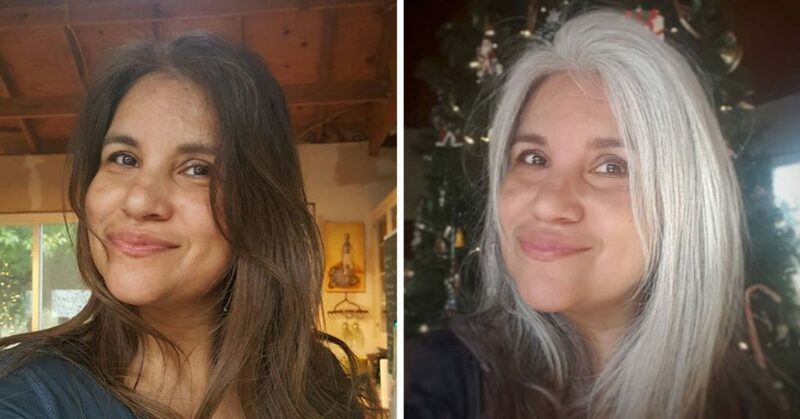 Honest thoughts- they are all beautiful in both pictures but the silver hair makes each one look amazing- younger and fresher! 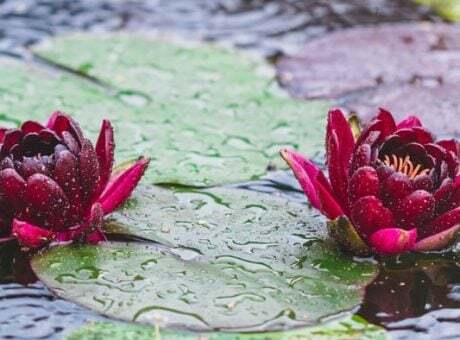 Thank you for featuring me….and many others. Wondeful to see how we all glow with our Silver! Nice but I don’t see anyone 60 or older . 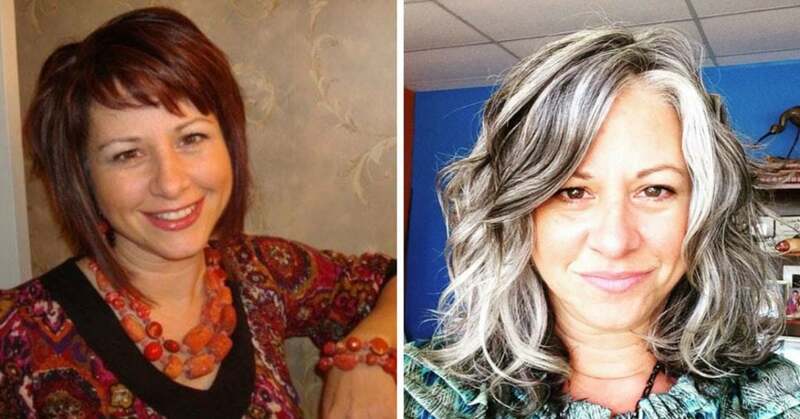 I guess because the point was that gray hair is not just for old people? Hi, Sharon – That’s not the reason. Nobody 60 or over offered to let me use their photos. 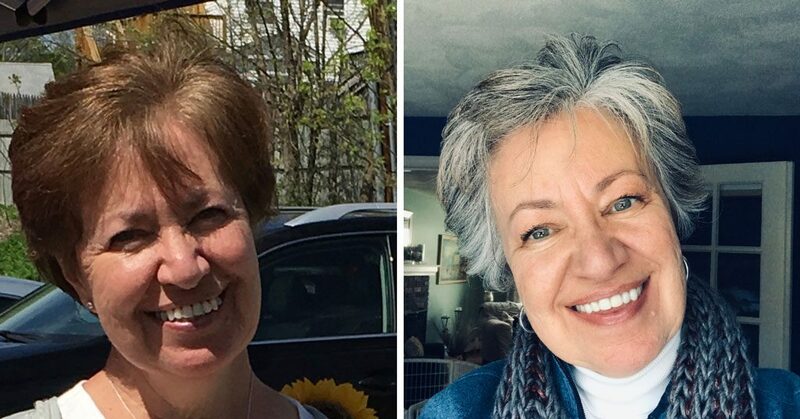 Believe me, I want to represent all ages on this site, but so far, no 60+ women have agreed to let me publish their photos. Maybe in the future! THIS IS MY FAVORITE!! LOVE ALL THE PICS KATIE! In EVERY CASE, they look at least as good if not amazingly better, silver. 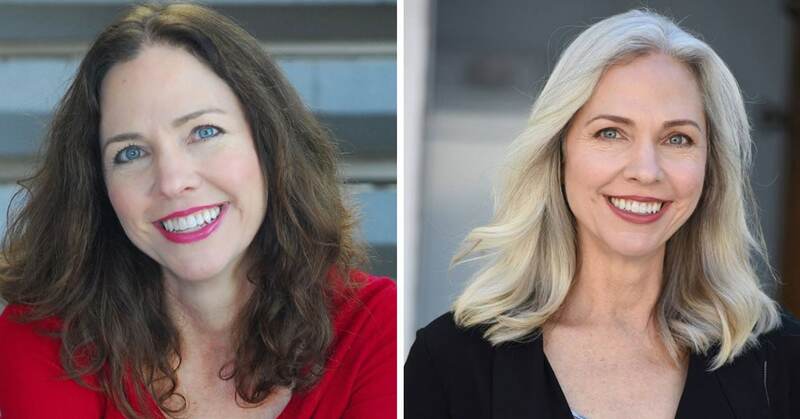 Sometimes they do look older, but when did older become such a bad thing? With age comes wisdom! 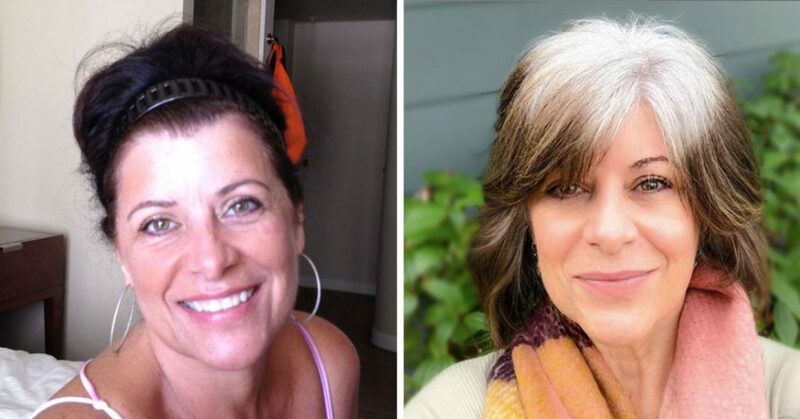 Love these beautiful transformational images! 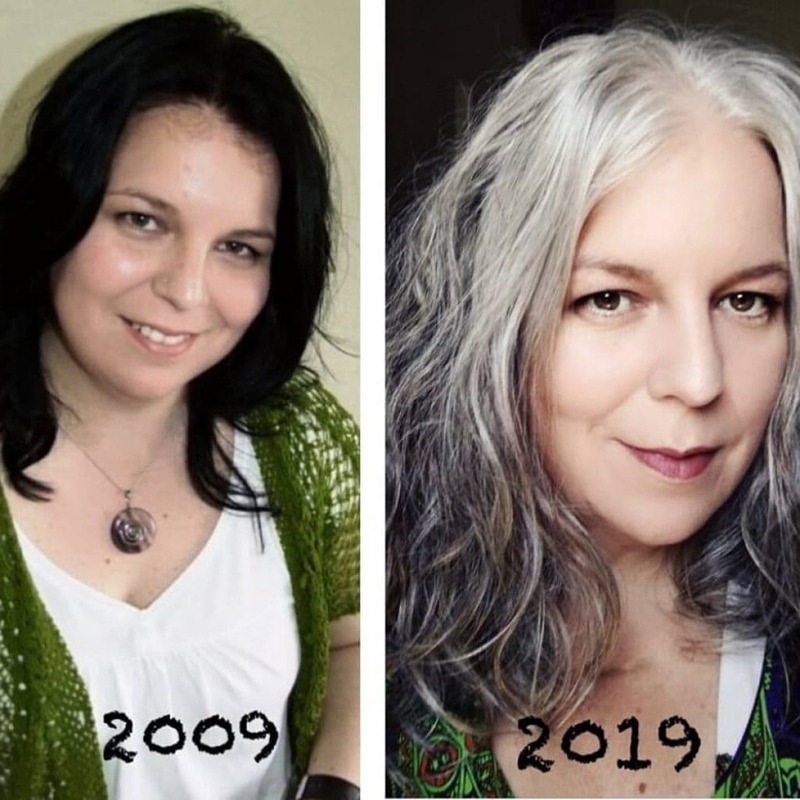 And don’t forget, for most of us it took a couple years or more to grow out the dye, so we are in fact older in the silver pic! It’s cool though, isn’t it?